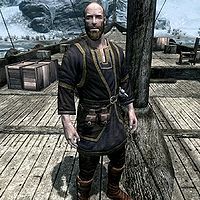 Kjar, a Nord ranger, is a boat captain commonly found on his ship, The North Wind, docked at the Windhelm docks. With the ship permanently docked, Kjar has no choice but to wander around on deck all day and night, at times pausing to sit down and eat. He wears a set of merchant clothes along with a pair of boots. He wields a steel sword in combat and carries some common loot and gold. When initially approached, Kjar will point out that he is not looking for new crewmembers: "Sorry, but I'm not looking to hire any more crew right now." Despite this, he will tell you, "You don't know what freedom really means until you've lived on the river." He will then go on to tell you about his life on the waters, stating, "Been on the river since I could walk. Wouldn't trade it for the world." He will also provide fair warning: "While you're on my boat, you follow my rules. First rule is, don't touch anything that doesn't belong to you." When asked if he is the captain, he will offer you a job: "The North Wind is my mistress, and I'm her master. I don't tolerate any disloyalty. You looking for work? Got a sailor who thought running a gang of thieves would be more money than hauling my cargo. You make an example of that gang, I'll give you a year's worth of pay." If you reject his offer, he will hatefully comment: "Coward." If you accept, he will say: "That's the spirit. ", and the related quest will start. When you have killed the leader of the gang, he will reward you and say: "Fine work. Here's your pay. Don't spend it all on mead." He will finish conversations with: "Right. See you around." or "Aye, 'til next time." Kjar is in the Winterhold crime faction, rather than the Eastmarch one. This page was last modified on 6 December 2017, at 19:25.